My kids are always so excited to give their friends a special gift for Christmas. 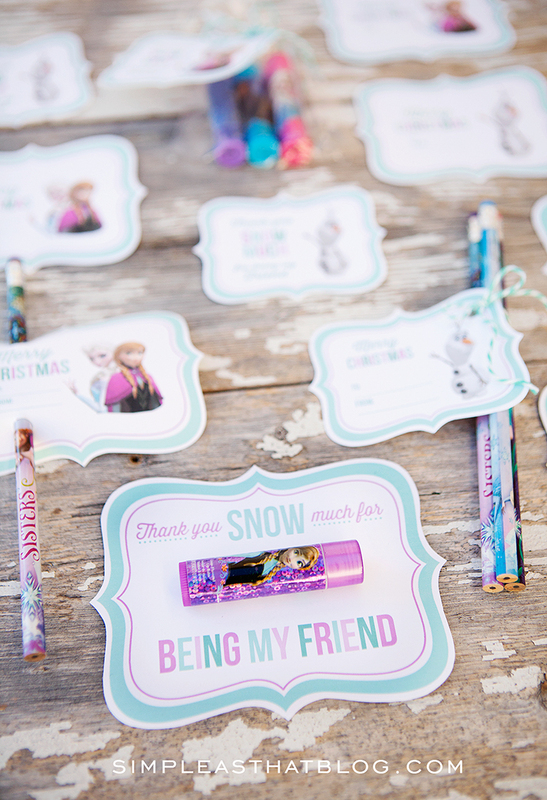 We’re keeping things cute, inexpensive and “snow” much fun this year with these Disney Frozen themed gifts and free printable gift tags! Scroll down for download links. 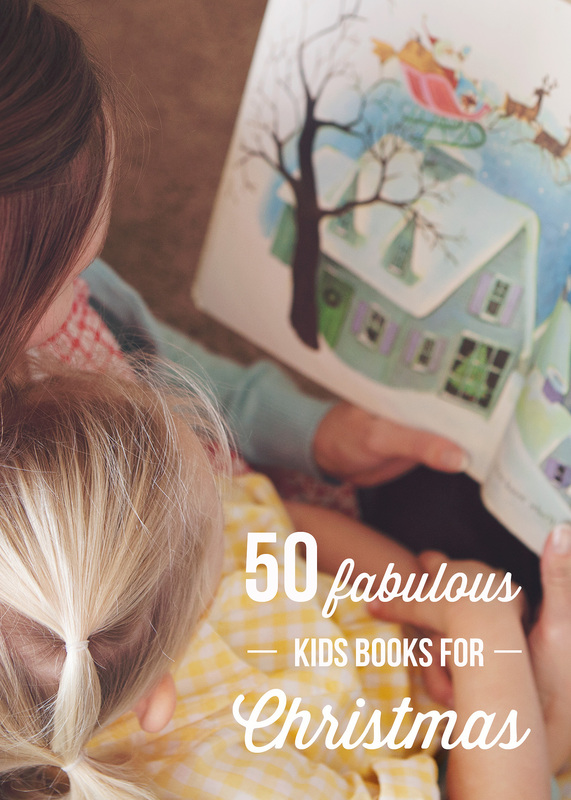 Each year we try to come up with a simple and inexpensive gift for the kids to give out to their friends and classmates. Keeping things within a budget, while still giving out something their friends will enjoy is always a challenge but it’s fun to get creative! 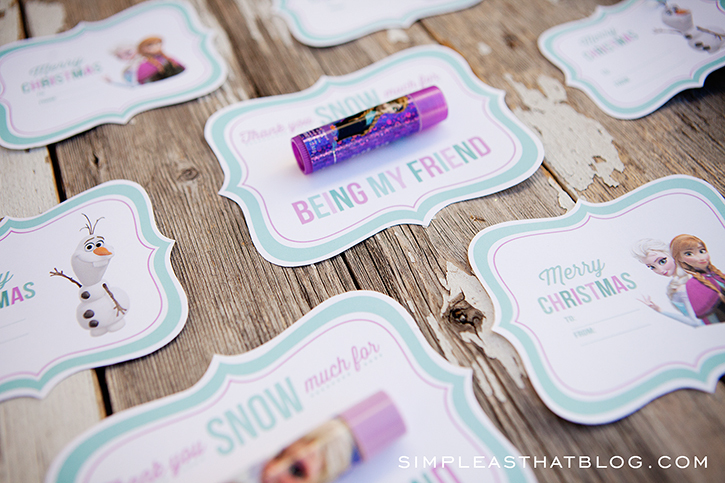 Here’s one thing we’ve given out in the past – Holly Jolly friend gift + printable tags. My two youngest girls (ages 7 and 4) love anything Frozen and I think it’s pretty safe to say, a lot of their friends do to! 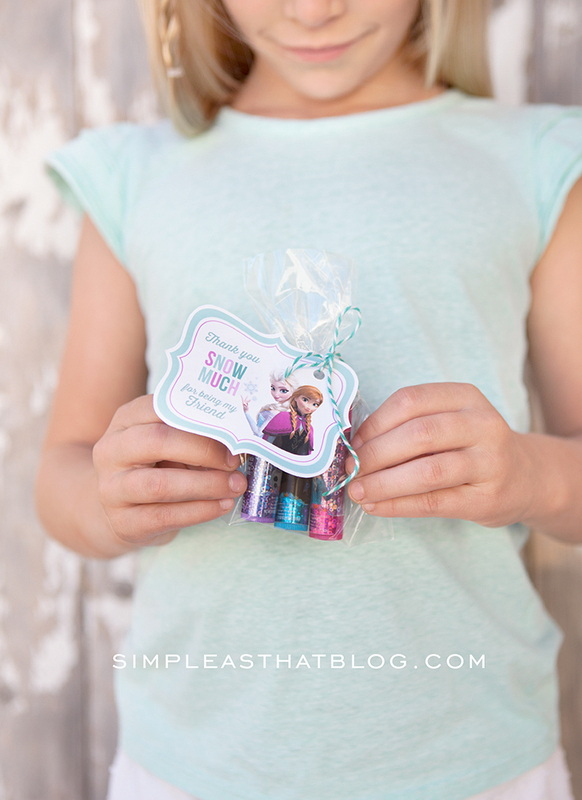 We’ll be giving out Disney Frozen lip gloss and pencils this year and we’re dressing them up with these cute Frozen themed gift tags. 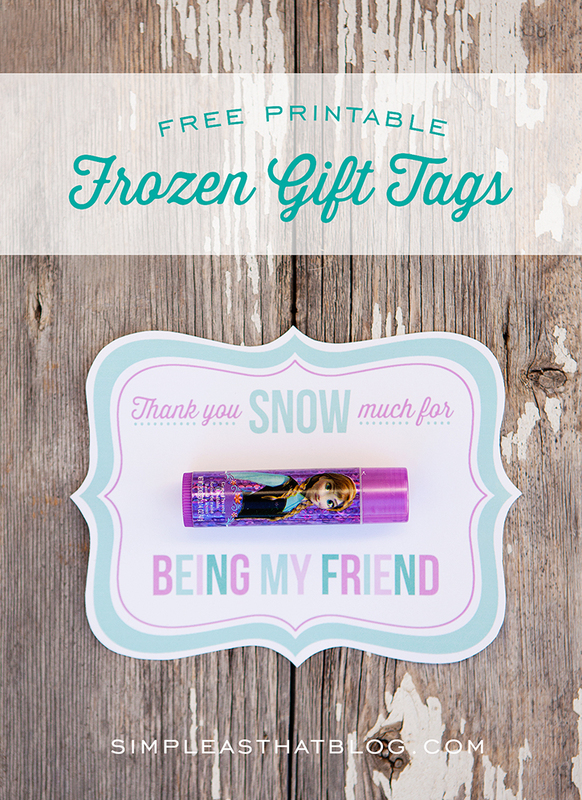 You can use any of the small gifts listed above or find your own, there are all kinds of inexpensive Frozen themed gifts available! 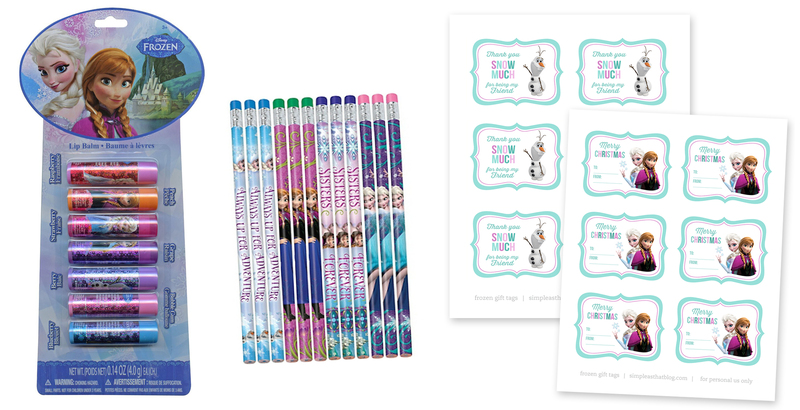 Check out these Frozen socks, Frozen Pens, Frozen Stickers and Frozen Jewelery. These gift tags will work for anything, there are variety of styles available. Let’s start with the pencil tags. The pencils can be given out individually or as a set. 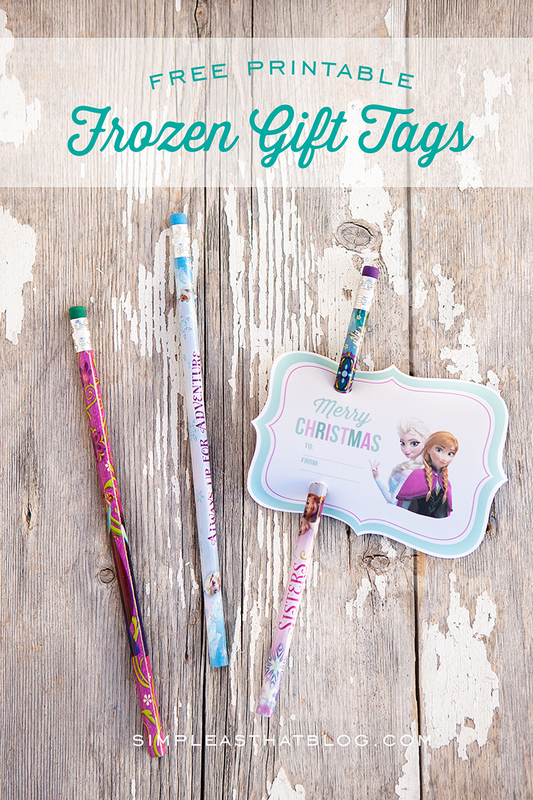 To package your pencils simply download and print the Frozen Pencil Tags. You can get fancy and cut the shape out or simply leave them rectangular with white space around them to make it easy. Once you have them cut out, write your names in the spaces provided then punch a hole above and below the text. Next slide your pencil through the holes, and voila! 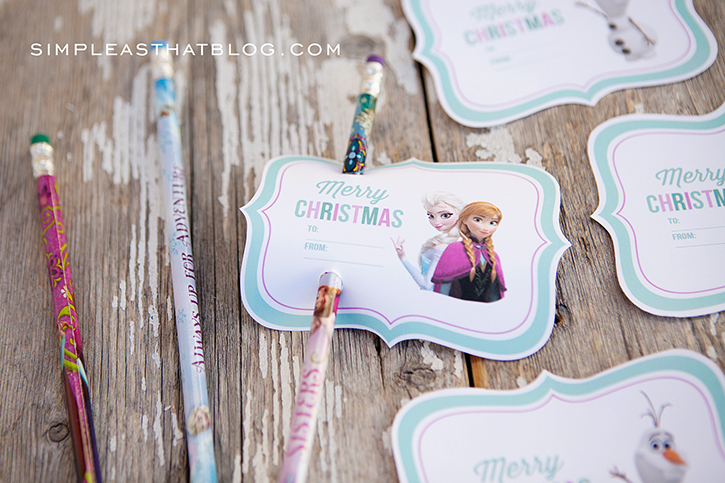 These pencil tags are available with Anna and Elsa or with Olaf. 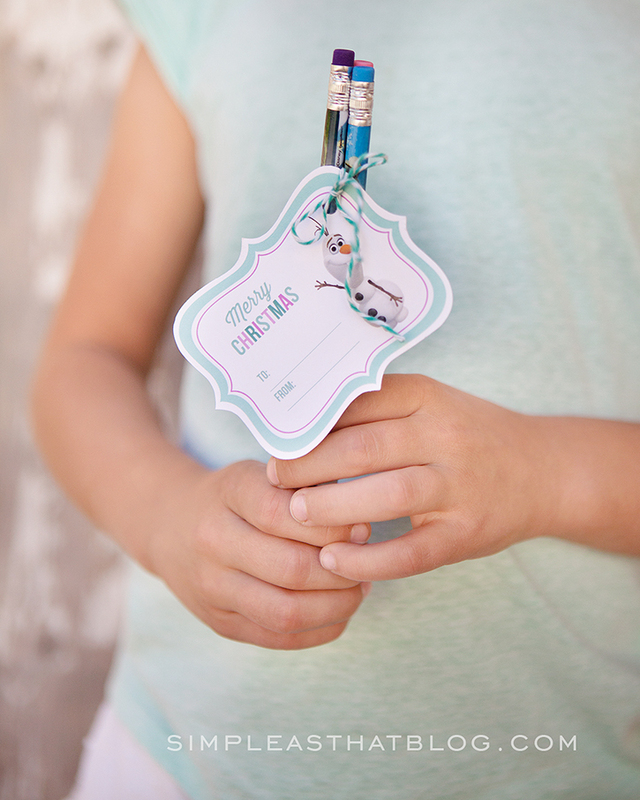 You can also use the generic “Merry Christmas” tags to gift a set of pencils. 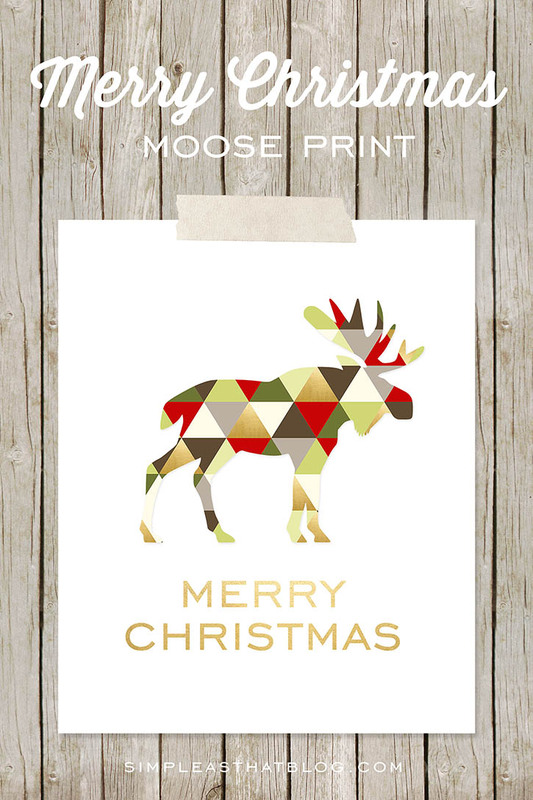 Simply print the Anna and Elsa or Olaf version, cut out and punch a small hole in the corner then attach with twine. Download links are included at the bottom of this post. For the lip gloss, there are a couple ways you can package them as well. 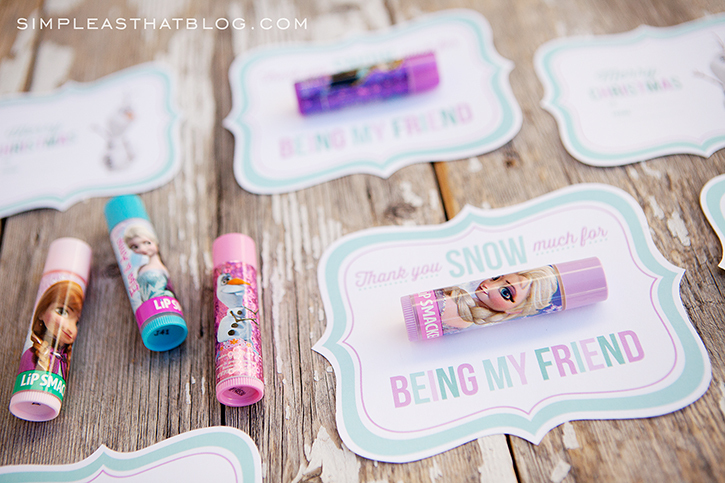 I created the larger “Thank you snow much for being my friend” tags to attach an individual lip gloss using a glue dot. 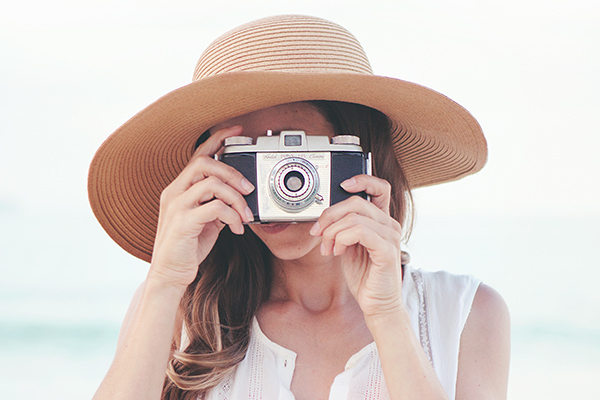 These particular tags are available in a JPG 4×6 version for printing at your favorite photo lab or as a PDF for printing at home. Again, you can cut out the decorative shape like I did, or leave them rectangular with the white space around to keep things easy. To package the lip gloss in multiples, these 3×5 clear cellophane bags by Wilton worked perfect! Put 3-4 of the lip gloss in a bag, print and cut out your gift tags, then punch a small hole in the upper corner. You can use the generic “Merry Christmas” tags or the smaller size “Thank you Snow Much for Being my Friend Tags.” Download, print and cut them out, then punch a small hole in an upper corner and attach to the bag with twine. 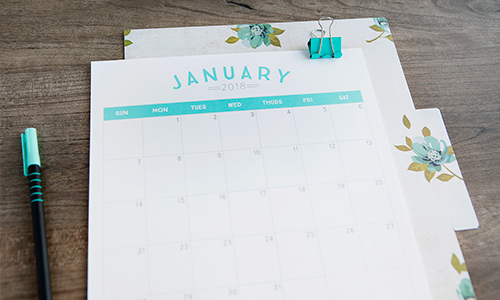 Stay tuned for two more quick, easy and inexpensive friend gift ideas coming soon! 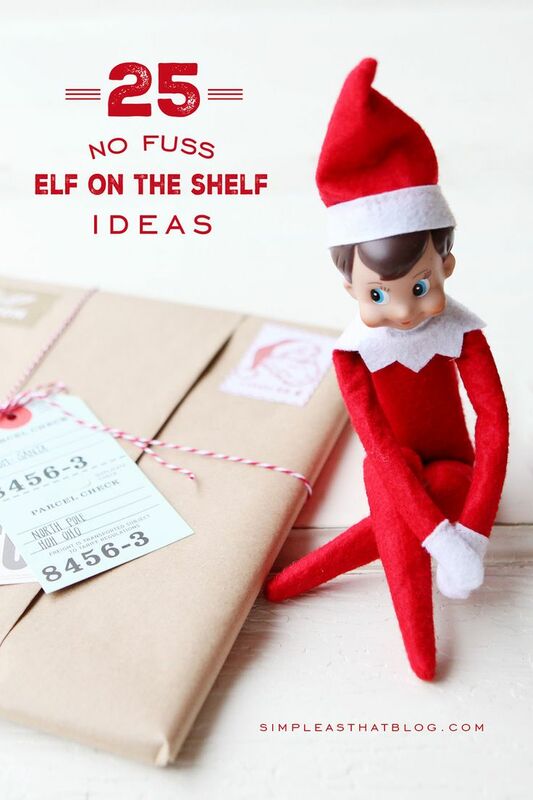 I’ll have printable tags and everything you need to put friend gifts together for boys and for tween girls! the CUTEST gift tags ever! Thank you so much for the tags! I can’t wait to use them for my niece. Is the lip gloss link broken? ‘Would love to be able to download it! How do you get the lip gloss tags to print in jpeg to send them to a printing facility? I’m have been trying to figure out the same thing. I am still waiting for a reply. I can only see the pdf link that has two to a page. Staci – just realized I said the Lip Gloss tags were available in 4×6 format and that I didn’t include that link. SO sorry! I’ve just added it to the post. 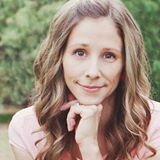 Hello Lindsey – these tags are only available in a PDF document. No problem. Thanks for your help. It was just confusing because the post states that the one for the chapstick was available in a 4 x 6 jpeg. You might want to edit that part of your post so people don’t keep bothering you about it. 🙂 I love your blog. Thanks for sharing your talent and taking the time to help the rest of it out. 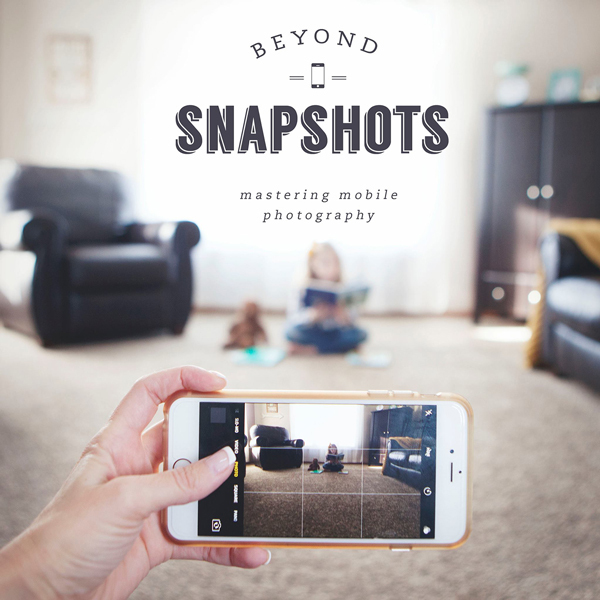 Your stuff is amazing. Happy Holidays! Thanks for these cute tags! We’re using them for valentines, along with a glow stick, and adding “let it glow.” Can you share which fonts you used?